The FBI is investigating Milwaukee County’s former register of deeds. The Journal Sentinel reports John La Fave, who retired abruptly last week, is under investigation, accused of stealing almost three million dollars from county taxpayers. Newly-released federal court documents say La Fave created false invoices with a Brookfield-based internet service provider called Superior Support Resources, for work that was never done. La Fave is also accused of a similar scheme with an Iowa-based firm. La Fave’s lawyer had no comment. Grand Chute police arrested a teenage suspect in a double homicide investigation on Sunday. Officers responding to a 911 call at around 11:30 a.m. found the two victims and the suspect, 17-year-old Alexander Kraus of Neenah, at a residence on the city’s northwest side, Officer Travis Waas said the suspect and the victims knew each othe. Waas said Kraus is a junior at Neenah High School. Grand Chute police are telling officials with the Neenah school district that Kraus also had a plan to cause harm at Neena High School. School officials say classes will go on as scheduled and extra police will be on hand as an additional precaution. Counselors will be available to staff and students. Police are recommending Kraus be charged with two counts of first degree intentional homicide. Twenty-two year-old Colten Treu, accused in a hit-and-run crash that killed three Girl Scouts and a mother, has been bound over for trial. A judge in Chippewa County Court ruled Friday afternoon that there was enough evidence to proceed with the case against Treu. Killed were brothers, 67-year-old Dr. Michael Rizzo, 76-year-old Dr. Vincent Rizzo, and Vincent’s wife, 74-year-old Mary Rizzo. A third Rizzo brother, 72-year-old Gerald, survived the crash and is stable condition at a hospital. “They were well-known, influential people in Kenosha, and it is with heavy hearts that all of Kenosha lost these three people,” said Beth. The suspect, 40-year-old Timothy Vandervere of Beach Park, Illinois, will face multiple charges when he’s released from a hospital. According to the sheriff’s department, Vandervere has a prior OWI charge. Although he has a valid Illinois license, his Wisconsin driver’s license was revoked. The Columbia County District Attorney’s office was closed Monday – no one seems to know why. The D.A.’s office has been short-handed since at least March. Three employees resigned after Governor Walker appointed Tristan Eagon as District Attorney. It’s not clear whether the closure is related to Friday’s unanimous decision by the County Board’s Human Resources Committee, that an employee has filed a credible harassment complaint against someone else in the D.A.’s office. Court proceedings were canceled Monday afternoon because of the closure. Even judges and other court officials were caught by surprise. Calls to the D.A.’s office on Tuesday went directly to voice mail. Wisconsin’s attorney general says a motion for a new trial for convicted killer Steven Avery “must be denied.” Josh Kaul says the usefulness of the evidence testing Avery’s attorney wants is questionable and the claims should have been raised before. Avery is appealing his 2007 conviction for the murder of freelance photographer Teresa Halbach. Avery’s attorney says some bones returned to Halbach’s family are evidence the bones found in a burn pit on Avery’s property were planted. 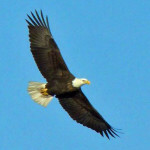 The Wisconsin Department of Natural Resources is asking for help to find out who shot a bald eagle in Marathon County. According to the DNR Bureau of Law Enforcement, the eagle was found lying in a ditch on the roadside of the intersection between County Highway Y and Hansen Road in the Township of Harrison. Investigators would like to know about any gunshots or suspicious vehicles in the area where the eagle was found, although Litvinoff said it’s unclear whether the bird was shot there or somewhere else and them thrown from a vehicle. Anyone with information on the situation is encouraged to call the Wisconsin DNR Violation Hotline at 1-800-847-9367. Sniffling and tearful in court, Jake Patterson pleaded guilty on Wednesday to charges in the murders of Jayme Closs’ parents and the kidnapping of the Barron teenager. Patterson’s attorney had to walk him through the pleas, and make sure that he was heard in court. Patterson faces life in prison at his sentencing date in May. The state Court of Appeals has responded to a request to stay a ruling overturning last year’s Republican authored lame duck laws. The Third District Court of Appeals says they’d like to hear from both Republicans and the groups filing the lawsuit challenging the lame duck laws. The court reminded Republicans that they have to file for appeal with Dane County Court, and that they want to have briefs filed by Monday. The Court also allowed Attorney General Josh Kaul a say in the case, since the ruling involves Wisconsin laws being made unconstitutional.